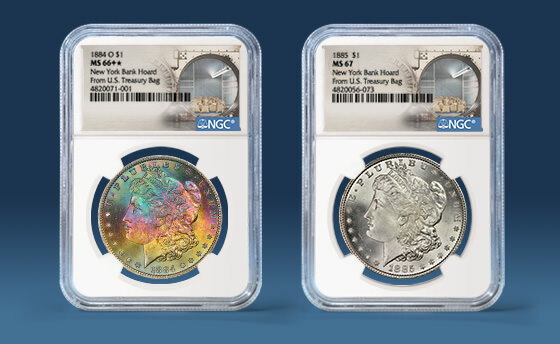 NGC has certified the New York Bank Hoard, a group of 16,000 Morgan Dollars that had been stored in sealed US Treasury bags for more than 50 years. The remarkably well-preserved hoard boasts a number of high-grade pieces, including 118 that were graded NGC MS 67. Each canvas US Treasury bag in the New York Bank Hoard contained 1,000 Uncirculated Morgan Dollars of the same date and mintmark combination. Eleven different issues were represented, the earliest being the 1878-S and the latest being the 1889. The hoard had been stored in a bank vault in New York since 1964, when the coins were purchased directly from the US Treasury. The bags went completely untouched for decades until they were submitted to NGC for certification with a special label and pedigree.